You’ve just been recruited into Mary Kay, and your recruiter and sales director are telling you that you need inventory. You can’t sell from an empty wagon! No one wants to wait for their products! Sephora has products on their shelves, so you should too! 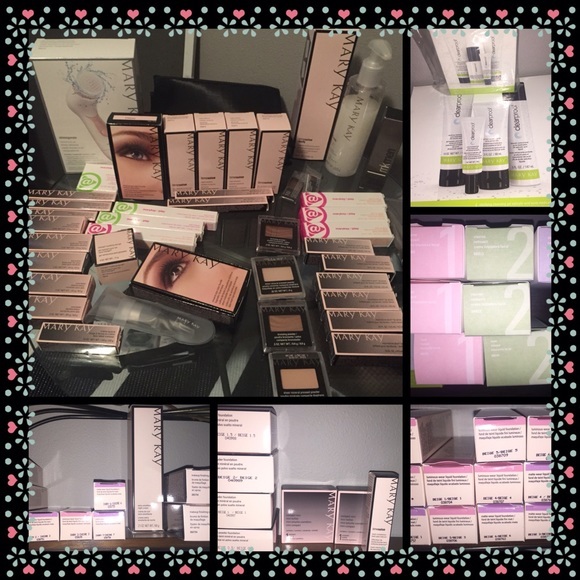 Unfortunately, purchasing inventory is one of the biggest downfalls for women in Mary Kay. Women end up with more products than they can sell, but they still end up needing to place orders for inventory they don’t have, and their inventory stockpile gets bigger and bigger. Even if you try to be cautious and only purchase a small amount of inventory, you will run into problems. If you can find customers, you will not have the products they want to order, so you will be constantly placing orders. There are minimum order sizes, so you will find yourself ordering extra products you don’t need, simply so you can meet the minimum. This is a twofold question. First of all, do you need an inventory? Certainly not in the beginning. Most women are familiar with online ordering, and waiting for their products. Women that order from in-home distributors expect to wait for their products. So as you begin your experience with Mary Kay, you need to take time to determine your customer -base, and see what you sell the most of. If you are tempted by all the free products that are included in your initial order, remember that it is like buying things you don’t need, just because they are on sale. Don’t fall into the trap of getting “free” product and ordering product you don’t need just to meet the bar for the next bonus. Unless you sell it, it becomes debt, not an investment. What size inventory should you have? As you gain customers, you will begin to have an idea as to what products you sell the most. When you are able to determine what would be valuable to have on hand, then you can slowly begin to order a couple extra things here and there to have ready for your customers when they order. To be honest, you do NOT NEED TO HAVE PRODUCTS ON HAND. Charge your customers shipping if you need to, and order their products in groups. In any given month, several customers may reorder, and then you can place one order at the end of the month. Do not, under any circumstances, allow your director place your first order, especially if you have decided to buy an inventory. She will order you a sampling of almost every product, things you may or may not be able to sell. YOU need to determine what products you will sell, and no one else. This is your decision. If you do not know what to order, do not order inventory! Make a smart business decision and wait until you have the money to place an order, money generated from your sales. Please avoid getting a credit card and placing an inventory purchase on it. It is debt, according to any financial adviser. It affects your credit score, opens up yet another temptation to buy even more extras for your Mary Kay adventure, and starts you off on poor financial footing. You may lose a few sales because you don’t have products on hand. However, the small amount of profit you might have made on those sales is nothing compared to the money you will lose by stocking inventory you don’t need, purchasing additional unneeded products to meet order minimums, and the interest you will pay on the credit card debt related to your inventory purchases. Also remember, that the sales pitch used to stock your shelves, comparing your mlm business to a retail outlet, is in no way accurate. You do not depend on traffic and point of purchase add on’s. You can not do mass advertising. You do not have a service differential like a yelp rating for being the best consultant in town. You never have to prepare for a mass showing on customers clamoring for your product because Mary Kay Cosmetics does not advertise for you. Mary Kay notoriously has in the past, only advertised for consultants! If Mary Kay cared about the way you have to get business they would go to work recreating the home party as the coolest method of consumerism in advertisements on all platforms. Nope. You are on your own. Only do NOT create a personal webpage…for your Unique MK Services…not allowed! So think. What possible reason would you need to have a Star Order on your shelves? There’s only one! Now Sales Development is boasting about “selling” 530,000 of their new vitamin c squares. That’s a average of 265,000/month or 6,000/week. Wonder how many shelves are just jammed packed full of these “sold” items that NO ONE in America is going nuts over? Inventory of a brand that still carries Mocha Freeze? They’re just now discontinuing shades like that and Toffee, Gingerbread, Frosted Rose, and Downtown Brown. As of this month, they’re finally moving those nasty, outdated shades off the market. So, no, having inventory of outdated, old technology-created products is a stupid, stupid decision. The moment I placed my first order, the company did as it always does and changed the products. No where to advertise either. Women are tired of being conned into these stupid mlm fake skin care parties with cheap products. Thank goodness some of the other poor souls in my unit agreed to trade products. I also began trading so I could return more. What little I had left over I managed to get rid of through other directors or consultants who agreed to trade for products I might use or return products for me. Then I only had a bit left to give away as gifts. I have never seen these products advertised in any real magazine or commercial. The slogan of selling from an empty wagon is a con. Absolutely NO one wants these products. The very few who get them want them at half price or less because they know that’s the going price. When my friend was recruited a year + ago she was soooo excited when she received her first inventory order-she took pix and honest to God she stood beside a stack of boxes that had just been delivered by UPS and they were almost as tall as her-5’5″. I can’t imagine how much $$ that was. I asked her what was all in it-she commented that she didn’t know, couldn’t wait to find out-and that her SD was soooo nice and offered to order inventory for her because she knew better what she would all need, what everyone buys, etc……She still has a lot of that original order and she is always running sales or specials. But, it’s HER fault it’s not selling. SHE isn’t meeting enough people. SHE isn’t going to enough meetings. SHE is too negative. Way back before this website existed, I was manipulated into letting my SD place my order. I didn’t know that I shouldn’t trust her. I assumed that she wanted me to actually sell my product! Imagine that! How did this NSD treat me? She ordered perfume and sets of bath and body products. She had me order men’s products. She ordered colors of eyeshadow, foundation and lipsticks for women that were a different race than lived in my area. Yes, there were things that were sellable to my customer base, but there was much ordered that just sat on my shelf. DO NOT trust anyone to order for you no matter how good she tells you the deal is. Follow the advice of this article because I guarantee you it will save you much more than money. I let my sales director do my first order for me too. It was an emerald star order. WHAT A MISTAKE!!! I appreciate the people on this site being kind enough to offer ordering advice to current new IBCs, but to me there is only one piece of ordering advice that makes any sense……Do Not Order, period. This MLM and most others will eat you alive. Run, don’t walk, do not pass go, just get out, or better yet do not get in to begin with. There is absolutely nothing to be gained from this narcissistic predatory con game, that can’t be better acquired elsewhere in an honest environment. You can find God, self help, self improvement, and you can help others in many more truthful and honest places. I beg you not to do this to your families as my wife has done to mine. Women are attracted to the “God first” approach in this organization, but from everything I see on this site, family never seems to have priority over career. Potential consultants would be wise to learn from the victims who have posted and commented on this site. Reality check: People want friendships without strings attached and the home party sales method is outdated and ineffective. My friends know if they come to my house they will be well fed and offered a beverage of their choice without a sales pitch. And yes, there are WAY better places to find God and self improvement. I know people who put their kids in daycare and gave away pets to free up their time to get ahead in MK. And then they look at you with ridicule when you say you watched TV with your family instead of working the phone for a Gold Medal. Don’t get me started about the obvious, flamboyant abuse of God and Bible! If only I’d read this a year ago. 😔 Now, I’m desperately trying to get rid of my huge inventory since I’m no longer active due to physical issues. Thanks for doing this to help out other newcomers to MK. I appreciate it and they will too! You can pack up and return the inventory you bought less than a year ago for a 90% refund PLUS 100% of the taxes you paid. It gets it over with quickly, but as inventory gets older it “afgges off” the list, so move quickly. Unfortunately, it has been more than a year. Now I’m faced with hopefully selling it somewhere online for a discount. Fingers crossed. Even if you don’t have inventory that MK will buy back it’s still important to cancel your consultant number. If you just go inactive you join your Director’s graveyard of Ghost Consultants. She still counts you as a unit member, and when you’re a ghost she can resurrect you without your knowledge whenever she needs a consultant to order so that she can win a prize or dodge a car co-pay. Oh wow! @MLM – I had no idea! Thank you!! Fastest way to get your money back is calling (800) 272-9333 and ask for the Repurchase Department. They’ll tell you the amount you’ll get back and guide you on doing so. Super easy!